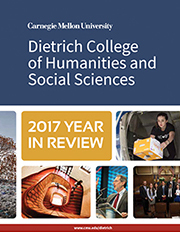 The Dietrich College is home to faculty and students who often cross disciplines to solve real-world problems and contribute in traditional ways. Among our world-class faculty are six American Academy of Arts and Sciences members, four members of the National Academy of Sciences, two members of the National Academy of Medicine and two members of the National Academy of Education. They do foundational and deep disciplinary research, collaborate, take on problems that are important to the world today and share a passion for innovation in both research and teaching. Our students are from every corner of the world and continue to achieve the impossible. They publish poetry, analyze brain scans and investigate how different relationships influence health. They teach elementary school students to speak Spanish and create computer tutors that teach algebra. They study how films shape our culture and learn about the impact that pollution has had on the history of American cities. And they are trained in a wide array of disciplinary approaches and become involved in research early and often. They emerge from their experience at CMU able to communicate, think, learn and understand the world in ways that will serve them for the rest of their lives. Emily Kennedy (DC 2012) transformed her senior honors thesis into a company that develops sophisticated machine learning tools to stop human trafficking. Department of Statistics and Data Science researchers have developed a new framework capable of finding rare, high-impact genetic variants associated with human disorders. Many Dietrich College courses throughout the fall 2018 semester culminated in capstone or final projects that focused on innovation, creativity and problem-solving.